My hometown recently got a Savers and I am obsessed, to say the least. I've been a thrifting fiend for quite some time, but this shop always has an impressive selection. I didn't want to leave the store there were so many good finds! 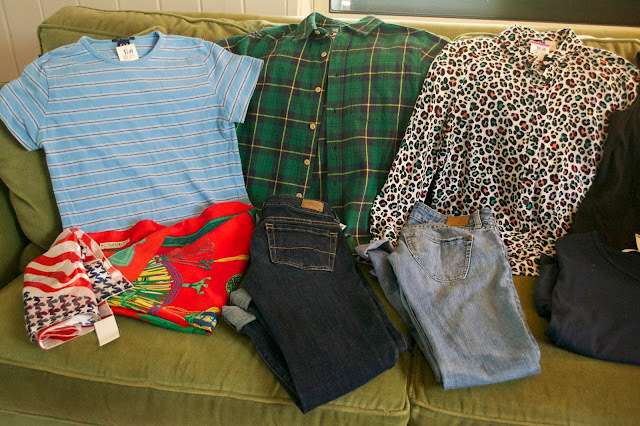 If you've never been thrifting before, definitely go and pop some tags. You're bound to find something that will make your stylish heart sing. Today's thrift shop haul was quite large. I honestly did not expect to leave with this much, but I love each and every piece. These items will be getting a lot of use their second time around. I purchased a blue Gap t-shirt with white and black stripes that will be perfect to wear with denim shorts and sneakers. It was only $3.99, so I couldn't leave it there. I also picked up a gorgeous Oshkosh flannel from the boys section which was a little more expensive at $11.99, but had the $30 price tag still hanging from it. It's a great find that I will get a lot of wear out of. The leopard print blouse is originally from H&M and cost $5.99. It looks like it was never worn. I also snagged two scarves: an Americana print that will be fab for the Fourth of July and a vintage, ornate print red one by Sunkyung Sa. I thought it looked really cool and chic. I bought two pairs of $7.99 pants, one being denim capris from American Eagle, and a pair of mom jeans by Bullhead from PacSun. Because it isn't a shopping trip unless I buy something black, I picked up two black tops for $4.99 each. The first one is a sleeveless button down shirt from Gap, and the second is a a ribbed knit sleeveless turtleneck that looks like exactly like something Brandy Melville would sell. 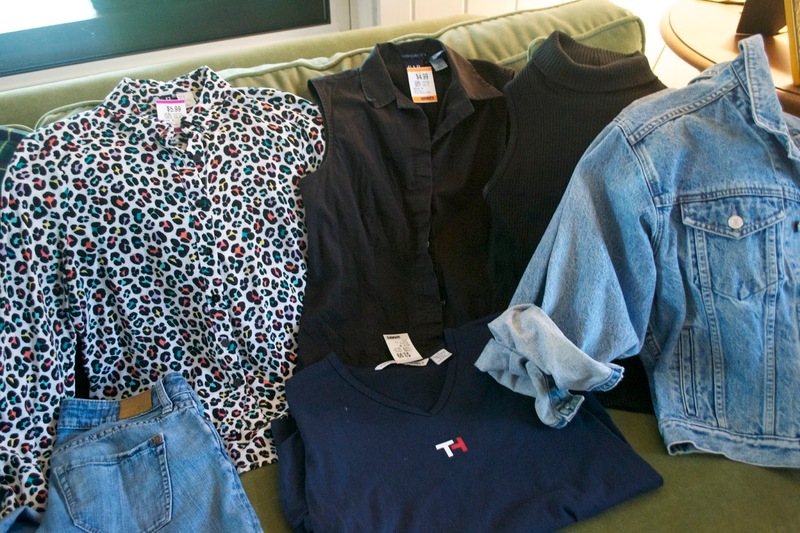 I also found a Tommy Hilfiger tee for $3.99, and again, from the boys section, a vintage Gap denim jacket for only $6.99. I couldn't believe it! This is probably my favorite find of the thrifting trip. I am beyond excited to start wearing it. I guess this throwback Thursday became a thrifting Thursday, which is still a throwback in itself. You can't help but love those throwback threads. I love thrifting. I am eyeing a dress in my local charity shop that I really want. 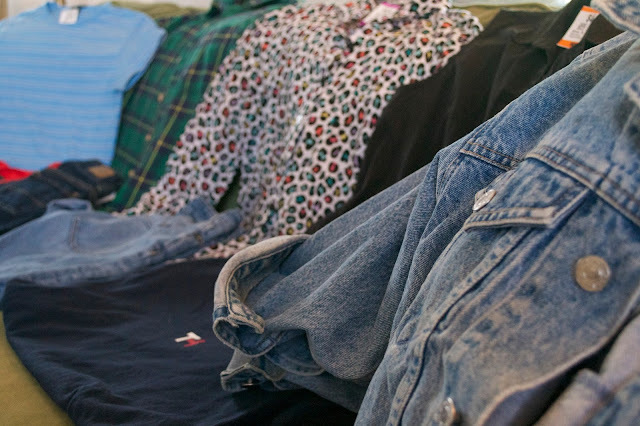 Would you be by any chance interested in doing a clothes swap? I'd send you a few items and you'd do the same to me? I love the flannel shirt you got! Thank you! Sometimes thrifting finds are the best finds. Great finds!! I love thrifting, but it's not always easy. You definitely have a great eye for it! !